Posted December 10, 2013 by Eric Graham . Within a Google Adwords campaign, ad extensions are links that appear below your ad that show useful information to a potential customer. These links allow users to navigate to a specific page or service you offer, find directions, or call your business directly with just one click. Notice how the ads have multiple links to give the user more options to choose from. Google will serve up the combination of extensions that it believes will best convert per ad, depending on the query typed in by the user. As you can see, the bottom ad only has sitelinks to pages within the website, the second ad has a location extension in addition to sitelinks, and all three have the phone number displayed. Though there are several options for ad extensions, the three main ones that should be included in every campaign are sitelinks, location, and calls. These can be found and edited under the ad extensions tab. Instead of pointing your customer to only one landing page, sitelinks give them an opportunity to click on up to six more specific pages of your choosing on your website. Sitelinks are extremely beneficial because they help with your click-through-rate and give you more insight into specific information users are searching for within your site. 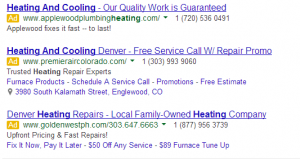 Great examples of sitelinks could be featured services, specials, contact information, or appointment forms. These will vary depending on the service you provide, so be sure to include pages that you believe will best suit your customers for increased conversions. Location extensions allow you to attach your business address to your ads, so that users can click on it directly for a map or directions. You can enter the address manually, or attach your Google + account to automatically pull the address. A Google + account is preferable because it directs users to your profile where they can read and leave reviews, and engage with your company via social media. Though the Google + location extension does not directly affect your business organic search placement, it can help increase Google reviews and social engagement, which is now playing a more significant role in organic rankings. Call extensions allow you to include a phone number with your ad without having to use up any of the limited text space. With the new Google Call Forwarding update that occurred this year, you now have the choice of displaying your real number or setting up a form of call-tracking, where Google dynamically changes the number in your ad every time it displays. This allows you to accurately track and gather analytical data, including the date, duration, caller area code, and call status. This can be vital information to your company, especially if you are not already using a different platform for call-tracking. To view how your extensions are performing, you can separate out your click-type under the segment tab, giving you analytics for the number of clicks/ impressions on the ad text headline and all extensions being used. Google is adamant about creating a user-friendly experience online for both AdWords and organic listings, and ad extensions are a great way to benefit not only the user, but also your business’ ad campaigns. The user finds exactly what they are looking for in one click, contributing to a higher click-through-rate, and ultimately, and better quality score, allowing your ad to display higher in search results. Whether you’re managing your own ad campaign and feeling overwhelmed or you want to start Adwords advertising to increase your company’s visibility and conversions, AMG has experts in a variety of marketing services including SEO, Pay-Per-Click Management, Email Marketing, Social Media, and Web Design. Contact AMG today or give us a call at 303-703-8000 for a free marketing assessment or to get started with you AdWords campaign!